Located in its own park, full of olives and magnolias, and opposite the town’s Greek theatre, the Grand Hotel Timeo dates back to 1873. 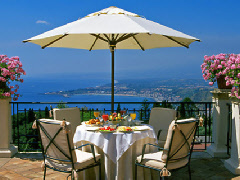 Since then it has been an ongoing haunt of cultural icons, drawn to the remarkable views to be had from its terrace - it is even possible for one to see Mount Etna in the distance. A veritable host of famous figures have rested here: Guglielmo Marconi, Guy de Maupassant, Oscar Wilde, Kaiser Wilhelm II, and D H Lawrence to name but a few. Operated by Orient-Express Hotels, the Grand Timeo boasts 70 guest rooms and suites, a five-star rating, outdoor swimming pool, wellness centre, restaurant, and “literary terrace” bar. More information to be uploaded soon.